At Voltage Wireline, we’re working in partnership to bring advanced fibre optic sensing technology to the Oil & Gas industry. We have a strong technical sales and service team dedicated to the deployment and advancement of this technology, for both in field applications as well as data processing & interpretation. In our modern and dynamic horizontal completion market, service providers must be able to adapt and deliver high quality solutions in a streamlined fashion. Voltage Wireline’s e-coil fleet is solely owned by our company and operated by our highly trained team, eliminating the need for more than one service provider. Building on years of experience, we offer a robust and complete suite of services for clients that includes acoustic, nuclear and correlation measurements. Our standard services also include cement bond logging, and a variety of ancillary offerings including; perforating, tubing and packer setting work. 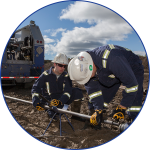 Voltage Wireline Inc incorporates innovative pipe recovery technology with over two decades of specialized industry experience. Our skilled Pipe Recovery Specialists can assist you with all your cased-hole and open-hole pipe recovery needs from start to finish whether it’s a slim hole, tubing, casing or drill pipe work.